Folk Songs of Canada Volume 2, Choral Edition is another collection of 77 of Canada’s vast resource of folk songs. 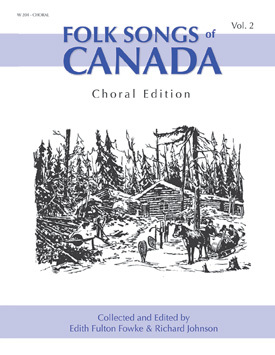 Arranged for choir, this collection includes not only originally Canadian works but folk songs that were brought to Canada through settlers – songs that contributed to the history of this great nation. In addition to an in depth introduction to the collection, the authors also provide a brief history of each folk song. The collection is divided under the following sub-titles: In the Beginning; Ballads of Long Ago; The Prairie Metis; Whalers, Sailors, and Fishermen; The Roving Shantyboys; Jack of All Trades; Love is Easy; Comic Ballads; Fun and Nonsense; and A Local Habitation. This is a must-have collection for choirs.